De-essing is one of the biggest voodoo in the mixing world. Sometimes it works... and ssssssometimesssssss it does not. This is why you have so many plug-ins on the market that do just that. They all have different algorithms and work in their own special way. This is why it helps to have a seasoned engineer show you how they work, show you pros and cons and most importantly point to you what to listen for during this risky exercise. Good morning children! Today, were going to talk about de-essers, lovely little creatures. Whats a de-esser? Its a machine that removes S's. Why do we need it? Well, S's can be annoying, especially loud on the vocal in the middle of your track. Did we always have de-essers? No! Back in the day when people used to record the vocals this far away from the microphone, there was no need for a de-esser, because the capsule didn't freak out. As the years have gone by, I guess the recording technique has changed, and now we record vocals this close, and capsules freak out. Now, you could say: why don't we just bring them down by hand? Thats done. But say your first verse is: She sells seashells by the seashore. Or, in French: Les chaussettes de larchi duchesse sont-elles sèches, archi sèches, then you do not want to do that by hand, you want a machine, hence the de-esser. Let me show you. First, lets listen to our example vocal. This is Alev Lenz singing "Dont watch me go" in solo, she can pull it off. Listen carefully to the difference of level between the regular signal, and the S signal in this take. Now, dont worry about the noises in the back, thats her playing Rhodes at the same time as shes singing, the clonk clonk in the back, thats live music, its ok, but listen to the: "I save myself... the drowning on your shore." Ss and Hs are very close in this case. Check it out. And then, edit that down. Not exactly my favorite sport. But it could be useful for the very difficult situations. Now, why dont we just compress it? Since the S is just louder than the rest, we can just compress it, right? Let's try that. Heres our trusty free Digi compressor. Lets listen to that. Pay attention to everything, not just the Ss. Pay attention to the whole signal. For me to be able to get the Ss, I need to compress so much that everything else gets compressed. Why is that? If you look at the waveform, it makes a lot of sense. This S here is actually quieter than the A right behind it, and way, way, way quieter than the drowning part here. And this is what the compressor sees. The compressor and our ears are different. Our ears perceive the Ss much louder, and much more annoying than the compressor will ever do. So what we need to solve the problem is a compressor that knows what the frequencies are, so we can tell it: Hey! Thats what I want you to compress. Thats a de-esser. Let me show you. Heres a very simple de-esser, the one that comes free with Pro Tools. Frequency: Where in the spectrum are you looking for Ss? Range: How much are you going to reduce the Ss. HF Only: That means that instead of compressing the whole range of the signal, its just gonna compress the high end, which supposedly is more transparent. And then, theres the Listen button. Crucial. Why? Because it lets you set up the de-esser really easily. What it does is let you hear what the de-esser hears. Not the whole signal, just what you're gonna focus on, where the Ss are. Because the principle is to say: compress just that. Alright? So check it out. This is with the Frequency all the way to the top, and Im gonna bring it down. I start hearing the Ss. My guess is that's actually much lower than that, say 5. Theres a lot of energy in this track at 5k. Maybe the choice of mic, maybe the singer, I dont know. Now, lets listen to what that does on the signal. Its very efficient. Too efficient! Even though I have the HF Only button in, which means its not gonna compress everything, its just gonna get rid of the high end of the signal. Its still too much, and sounds very processed. So lets shorten the range. Same spot, just less action. Without, it sounds like this. You noticed that the first S gets caught, but the second doesnt. If I were mixing this track, I probably would decide that this particular de-esser is not working for me right now. Usually it does, in this case it doesnt. As a side note, this de-esser is really an extension of what a dbx 902 used to function like and I think it would be interesting to listen to what a dbx 902 used to function like, because it was in every studio in the world. And I happen to have one! So I have a dbx 902 inserted as an I/O loop in Pro Tools on my track, so you can hear what it sounds like. Here we go! Different animal. Without, it sounds like this. The 902 is actually better than the Digi de-esser at catching that second S.
but, not quite what Im looking for. It still sounds a little artificial. Lets keep looking for another tool. There are lot of cool de-essers around on the market, they all have different sets of features, and each and everyone of them has one different little advantage. So its cool to have several, so you can find the one that works for your track. Here, I have the Massey. 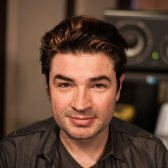 Stevens great plug-ins are really affordable, they always work awesome, Customer Service is great, its worth the investment. This de-esser is yet another extension of the 902. It does a couple of cool things that I wanna show you. you know, that Listen mode. So, if I play the track, it sounds like this. I think this is about right for us. Notice that the riding on this box has no matching whatsoever with the riding on the other box. The other box said 5k, this box says 3.6, and Im hearing about the same thing. Why is that? Probably because the filter is different. Dont always believe whats written on the box. Another cool feature is if you turn the Listen on, and hit this button, you can actually hear the difference, meaning, what you are removing from the signal, by itself. Check it out. Isnt that magical? So, obviously Im being a little brutal here. Ok! That sounds great! Now, lets listen to the full signal. I still hear the first one a little bit too much. So Steven has put an interesting feature here, which is a dry/wet signal. What does that do? Well, if you consider the de-essed signal wet, and the unde-essed signal dry, you can actually bring back some of the dry signal into the wet signal and compensate, and do a nice balance between de-essed, unde-essed, everything in phase. It sounds like this. If I bring some of the dry, it sounds like this. These things are subtle, but this is the difference between a demo and a record. It works great, but its not what I need for this particular track. I can see it working for a vast majority of tracks, but in this case, I need something a little different to be able to catch the two different levels of S's, and that H in the back. So lets look at something else. This is the Waves Renaissance De-Esser. It has one cool trick that I use when Im stucked like this. I can go in Side-chain, just like in the Massey, its the same as the Listen button on the Digi, and listen to whats going on. and find out where my S's are, first step. Little difference here, Im using an actual bandpass filter, meaning that Im listening to this part of the signal, as opposed to a high-pass filter that just goes like this. Meaning that the de-esser will respond to things that are happening above my filter frequencies, whereas with the bandpass, its just gonna focus on that one spot. Now, theres two modes here: WideBand and Split. Thats the same as Broad, or HF Only on the 902, or on the Digi, those are the two modes. Same exact thing, different names, they just wanna confuse us. Very successful at confusing us! To use this, I just switch back to Audio and lower my threshold until Im happy with the signal. Let's go crazy! So, just like the other ones, its too much for the first one, and just about right for the second. But this plug-in has a Range control. Wait! I can explain! The Range control is also in dBs. And what it does is it allows you to tell the de-esser how far it can go. You can put a limit on how much it can de-ess. No matter how low your threshold is, and no matter how hard the de-esser is willing to de-ess, you can tell it: No, no, no! No more than 6 dBs, and thats it. You can do 2 dBs, you can do 4 dBs, but you can never do more than 6 dBs, or 5 dBs, or whatever you choose. Its a great way to make the de-esser super sensitive by lowering the threshold, so that every S, or anything that resembles an S, will trip it. Lets try 5, with the same threshold as before. Definitely more even between the two Ss, and more natural than what we had before. This seems to be the right tool for this problem. Am I super, super happy with this? Not bad! Can I do better? Maybe! Lets try something else! Next is the Oxford SuprEsser from our good friends at Sonnox. Full disclosure, I had a fairly heavy hand in helping design this thing, so it does what I want, so I like it. This is a slightly different principle, its broader and does more things, but you can use it to de-ess. So the way you use this is go in Inside mode and listen to just the part youre gonna work on. The cool thing about this one is, if you noticed, when I play the signal, theres a red line, vertical, that shows me where the most energy is, at that moment, in the signal. And I bet you, thats where the Ss are. You see? I missed it. Im a little too low, so Im gonna go higher. See, thats where the S is, this is where the rest of the energy is. the SH is at 4.1. So Im able to actually have a broader band here, and take care of all that stuff at once. It's very nice. Its a little bit like the bandpass in the Waves, but more precise and more flexible. So, the next thing I would do is turn on the effect, go back to listen to my full signal, and lower my threshold. That works nice! Lets focus on the first two Ss, maybe even lower. You can push it further by hitting the Access button, and now you have full control over everything, attack, damping, wherever the trigger is in the band, or actual fully level-related. Theres also a Wet/Dry signal here, so you can tuck in the dry back under the wet, like you do on the Massey. One setting I use is this one, the Ratio here. I can actually decide that Im gonna be a little more brutal on the Ss. So, say Im gonna limit the range, a little bit like the Waves, less compression, but at a lower threshold. Or a lot of compression at a higher threshold. Option A! This just was not very good, so I switch back to a lower threshold, and a limited amount of compression. This is an amazing plug-in, and its not just for de-essing, because its full range. So you can actually remove something of the like of an S, like some short burst of energy, automatically, very easily. I think we should try something else, just because we can. I wanted to show you the Eiosis, because its fairly new, so not as many people know it, and I think it has its own merits. The way it all functions is this way: Detection, Sibilants and Voiced. Detection is your key, the Listen thing. The Sibilants is the Ss, and then Voiced is the rest of the signal. The thing thats different here is you can actually process  EQ the Sibilants and the Voiced separately. It can be useful, check it out! So first, lets listen to the key. Ok! It understands both, my first and my second S very well. And then, once I heard that, I can say: Oh! lets just listen to the Ss, just like I did on the Massey. Isnt that pretty amazing? You just hear the Ss. And then, just the rest of the signal. what can I do with this? Since I have both signals separated, I can for example add some brightness to just the Voiced signal, but not the S! So I can retain that aaaahhh thing, that maybe other de-essers would remove, depending on what the signal does, without touching the S.
If I put the two of them back together, it sounds like this. And the Drowning is not touched. I could make the S brighter. Why would I do that? Well say if I make the S brighter, but quieter, it wont feel dull, it just feels right at the right level, and at the right color. Its a little more complicated to set up, and more intense to learn, but if you set it right, you can really get the feeling that you have a special fader just for Ss, and thats a good feeling if you fight with Ss a lot. So Id like to review everything weve seen today. First, the built-in Digi de-esser, which gives us the basic principle of how it works. Then the 902, one of the original designs. Then we've seen what Steven Massey does, with the cool Wet/Dry ratio. The Waves, with the Range feature, and the band split. The Oxford, super precise, razor-sharp, lots of features, CPU hog. And then the fairly newcomer Eiosis, that does tricks that nobody else does. So which ones the best? I dont know. Do you like a bright UI, a dark UI? Big knobs, small knobs? Do you have a fast CPU? Do you like numbers, no numbers? Its up to you, really. This was an overview of the available features. Hopefully, now you know how to deal with de-essers. I love the R-Deesser! Thanks Fab! Love your videos also. So helpful. Game changing! Loved all your videos man, incredible stuff! The things you are telling, equipment and the software you use and the way you explain and make your videos. Just Brilliant! Definitely going to pay for some videos cuz' it's worth it. One question I have is - does it worth your time to go through all of the deessers to find the right one instead of just automating any 1 of them? 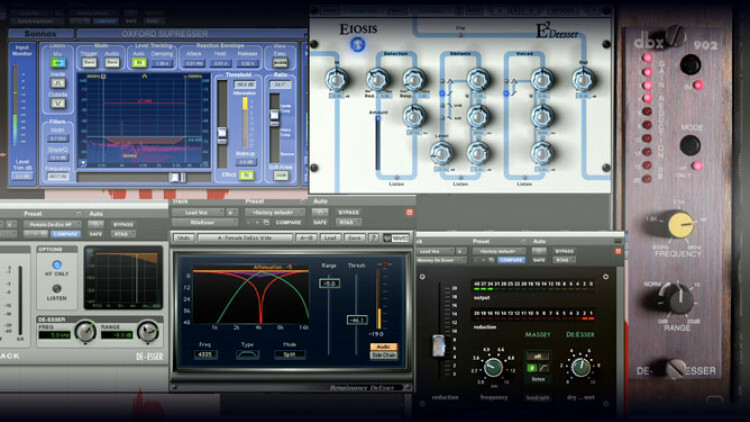 cool video - just a note: in the EQ video for vocals it says that S-sounds are around 6000-8000 Hz. In this video all S-sounds though are around 4000-5000 Hz. For a beginner a little bit confusing - though you say that frequency ranges are not absolute in all de-essing plug-ins. Free de-essing enlightenment, than you very much. Sonnox De-Esser seems to be very versatile... like for using in a backing vocals submix when they peak in some freq (1,9-2,2 khz). Awesome video. I finally get it! Deessers aren't an easy tool to use without a great amount of understanding and listening! Thanks Fab. Very good, informative and short tutorial. Fab you're great at explaining how this units work. Great job. Learned a lot. Thanks. Hi Fab. What about if you are dealing with both S's and SH's which are at slightly different frequencies? Would you use two narrow band de-essers, one for each problem area? Or perhaps just set one de-esser at the lower SH frequency to treat everything above it? Thanks very much. Exelente tutorial, me encanto el de-esser de Eiosis. Hi Fab Great stuff here. But s il te plait .Veux tu bien arrêter d utiliser le mot "enfant en t adressant aux gens ? C est un peu dérangeant et je ne suis pas le seul a le dire. Sans rancune. Thanks for this viedeo, Fernando from Uruguay !!! Great clip. The E2 Eiosis is great too. My fav De Esser. Oxford is great also. you guys re gonna get my money....this site is brilliant. Great Video! Fabfilter's new de-esser has been the best I've worked with so far, and exceptionally transparent and easy to dial in. Could anyone please tel me if it's best to put the 'Deesser' 1st on the channel strip before the EQ or after ? Can't we ask the singer to stand further back ? Great tutorial, thanks! I'm really interested in Demoing the Eiosis E2 De-esser. Thanks for posting this FAB. Another VERY useful video! Thanks! Really nice tutorial! Keep on likke this! Great tutorial!!! Love it, love it, love it!!! I have a question for you...are there frequencies that instantly come to mind when you think of solving sibilance problems? So for example when de-essing a male vocal what would be a good starting point for S, Sh, Th, F, etc.? I never know where to begin and tend to overly rely on the de-esser to compensate for my ignorance! I would love to know where to begin looking without the aid of a De-esser. PS Thanks for the heads up on the Eiosis De-Esser. It's a fantastic plugin. great video, excellent presentation and production.